The Roof is what protects and covers the entire structure; there is a saying; no roof, no house (taken no doubt from a similar saying about horses). And, it's true. If the roof leaks, or is installed incorrectly, to fly away on the next windstorm, then you have no house - it will quickly rot and become unlivable. 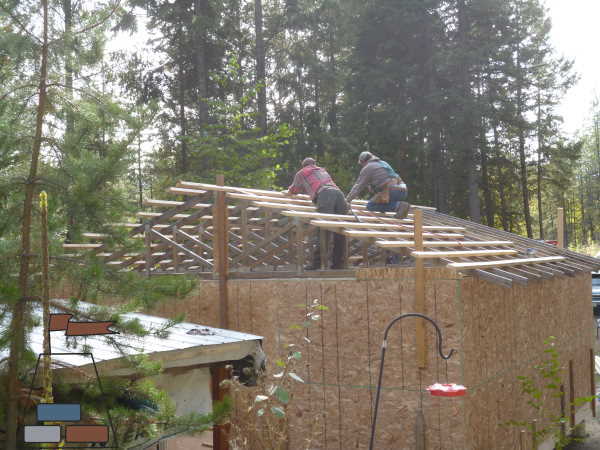 2x4 lumber strapping is nailed onto each truss - this gives a good strong base for the next step of the metal; but first, the roofing felt is stapled on underneath each piece of metal roofing. 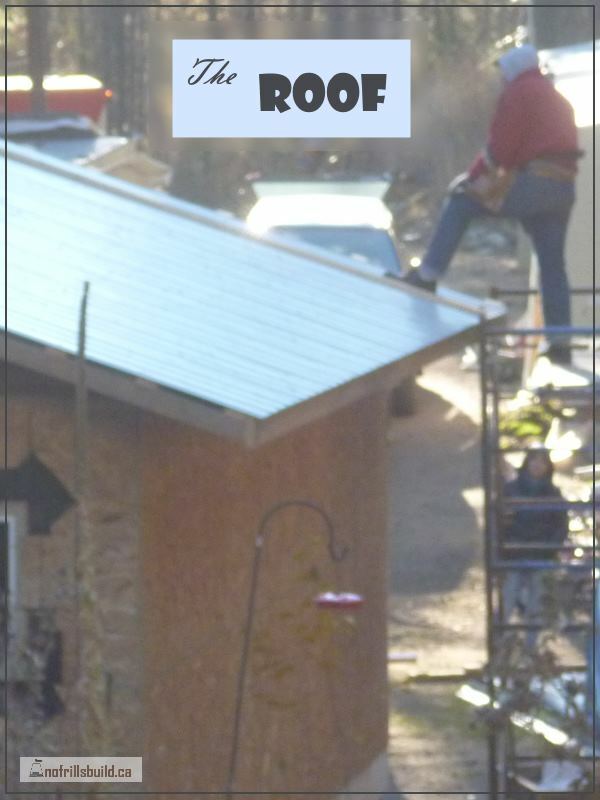 The other part that is crucial for the strength of the roof is to tie it all together with a fascia board. Mike did this part single handed - he's very meticulous, and took extra care to make it all perfect. 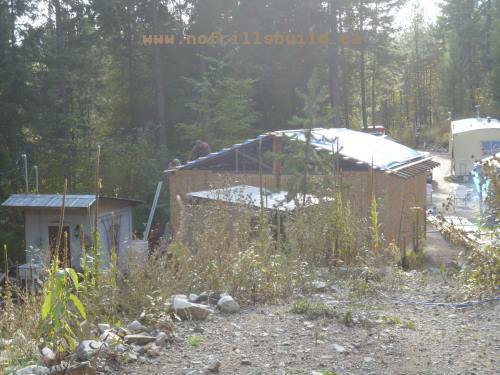 With a roof this size, and uncertain weather, the tarps were in constant motion - peeled back to work on a particular part, then re-attached for protection overnight. 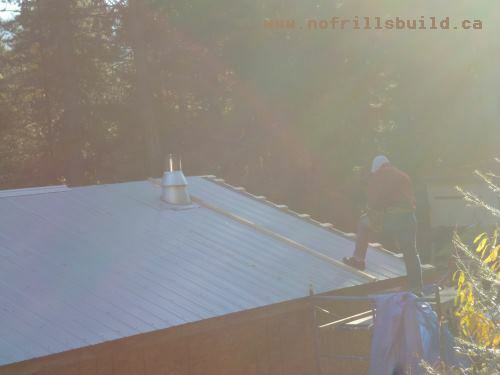 But then, the tarps are gradually replaced by the metal roofing; this comes pre-cut to your specifications, and varies in coverage - this is 32" coverage, which means that each piece is 36" wide and overlaps to form a watertight seal. 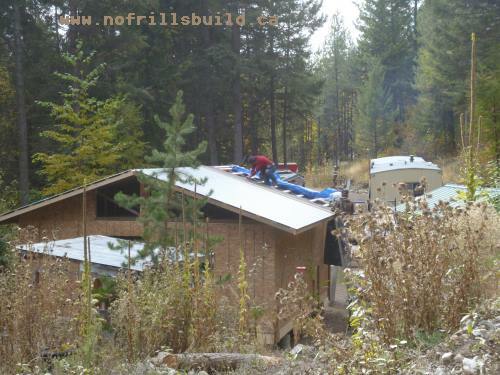 The final piece of metal roofing is installed - the wood is a 'dummy stick' with markings for the screw pattern. This ensures that each screw goes into a piece of the strapping, not into thin air where it will cause a leak, and it's not attached so the piece of metal will be flipped off by the wind. 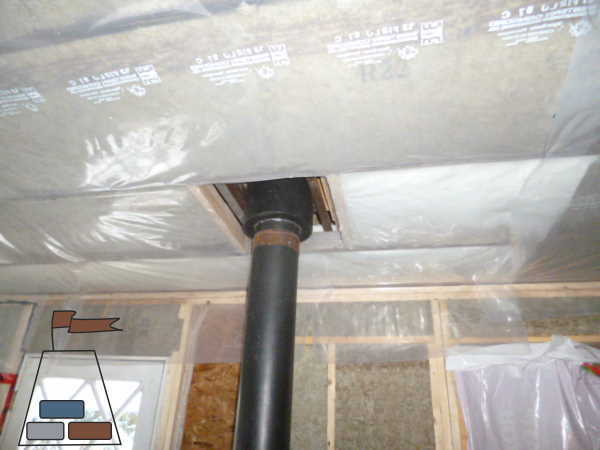 Wood heat is great - but it's important to make sure that all your installation is done correctly and to code. The inspection of the chimney can be the difference between happy contentment, and a burned out hulk. Please do it right! 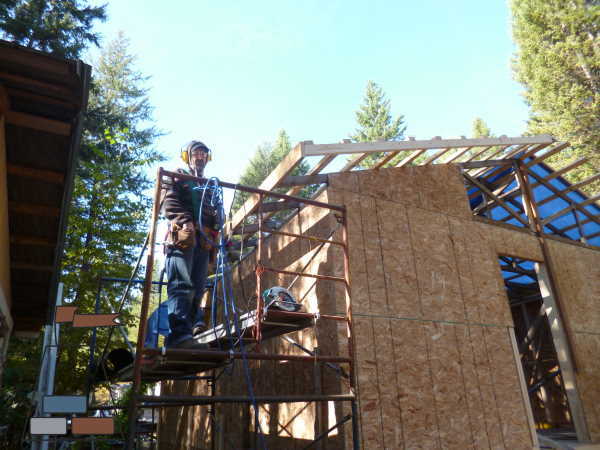 We put in windows at various stages, but all were done after the initial roof was installed. Doors were important too.